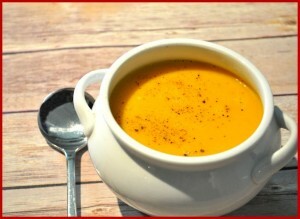 Make this a more luscious soup by adding a little cream on top, or even creme fraise or some natural yoghurt. For this recipe, to get more taste, lightly fry the onions and ginger in a frying pan with a teaspoon of coconut oil. The onions must stay white, so they will not need to be on for long. You can miss out this step and just put the ingredients straight into the pan if you are in a hurry, but the taste will not be so rich. Add all the ingredients except the ground rainbow peppercorns into the soup maker and set it to smooth for 21 minutes. With stock, fill to Maximum In Soupmaker or up to 1600-1800g for all ingredients manually in a pot. Serve and garnish with rainbow peppercorns.